Beekeeping is perhaps one of the most rewarding and fascinating practices to undertake. Even though most people view bees as unwelcoming, such a perceptive in most cases stems from a lack of substantial knowledge about bees. Bees are naturally territorial and are hospitable as well if you know how to handle them. They need a good habitation to thrive and never tolerate any invasive behaviour. That may explain why they can attack at times when provoked. Fortunately, you can keep the bees at bay by providing an ideal environment for them. Your first step should be to invest in the best bee hive box you can afford. The beehive is their home and therefore such a decision should be taken very seriously. With many readily available beehive options available in the market, narrow down your choice by checking out the best bee hive boxes outlined below in this article. Choosing Bee Hive Boxes – what to consider? Does the hive allow the use of standardized equipment and accessories? Having one that allows you to share hive accessories such as brood and honey frames can be a plus. It should also be easy to add more frames when the bees have fully utilized available frames. A good one should make it easy to harvest the fruits of your labour – the honey. An ideal beehive makes it easy to work on the hive with little disturbance of the bees. Choose a hive that inhibits drone production and maximizes the production of honey and brood. The bee hive box chosen should have a design that provides your bees with the right temperature and aeration. The bees should be well protection from elements of nature such as rain, cold, and temperature changes. Choose a bee hive box that is easy to setup. The joints on the wooden components should interlink well and easy-to-read and follow instructions should be provided. For best convenience choose a hive that can easily be disassembled and assembled. This makes transportation easy. Bee hive boxes are built using different types of wood. The best bee hive boxes are those built using good quality material. We are never equal when it comes to financial status and this will dictate what one can afford. If you are well-endowed, why then should you not go for the best you can possibly find? 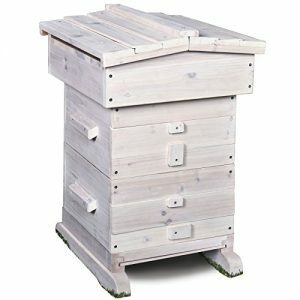 The Valley Bee Supply 10-Frame Beehive is made using unfinished New England White Pine. It comes unassembled and without any finishing. It designed for the pro-beekeeper or a beginning that is willing to buy the other beekeeping supplies separately. The unit is easy to assemble and comes fully-packed with most of what is needed for kick-starting or expanding your beekeeping enterprise. The Valley Bee Supply Beehive comes with 2 deep boxes and 3 medium-size boxes. These have been drilled already and the joints fit perfectly. Its handles are pre-cut so as to offer a better grip and resist rot. Furthermore, the hive boxes are made using high-grade plywood which lasts for years. The unit’s roof is made of heavy aluminium that is rust-resistant and it comes pre-assembled just like the bottom board, inner cover, and slide out tray. Another feature of the beehive is the entrance reducer included. Nonetheless, it is foundationless and lacks nails and frames. These have to be bought separately. The Happybuy 2 Layer Beehive is made of pine wood and measures 24.5 x 20 x 16 inches and weighs 16.18 kgs (35.67 lbs). The unit comes with one deep brood box, an entrance reducer, 2 windows for viewing the hive, a solid bottom board and an inner cover. The foundations are also included. The honeycombs are very easy to remove so as to prevent the bees from coming into contact with the hive wall and honeycombs. Its overall design is appealing, safe, and convenient. It is also easy to install this bee hive box kit. One of the most outstanding features of the Happybuy 2 Layer Beehive is that it is compatible with the traditional beehive. It is also important to note that the wooden material used in building the hive has been subjected to a mechanical drying treatment. This helps ensure the beehive does not crack. Its outer wall has also been polished to prevent water infiltration. Furthermore, honey is harvested via the efficient auto flow technology. This bee hive box kit is a sure bet for the savvy buyer. All beekeepers whether a beginner, hobbyist, or professional share similar desire – to build a prosperous bee colony. This can only be possible if the bees are given an ideal environment to nourish and cater for themselves. The young ones need specific temperature and moisture conditions, so does the queen and worker bees. This is why it is important to choose a good hive kit from the beginning. 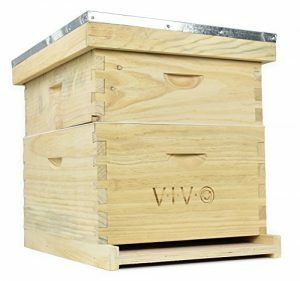 The VIVO BEE HV01 is a complete hive box that has all the bees require to nourish and thrive. It is designed in such a way that all weather elements are kept at bay. Click here to read our full review of the VIVO BEE-HV01 Complete Hive Kit. The VIVO HV01 is made from soft pine which is lightweight and appeals to the bees. All hive components are tightly-fitting and require a little assembly. If you have no experience in carpentry work then you do not have worry since an instruction manual is included for guidance when assembling the unit. This is a complete hive box that is designed for all skill levels. Secondly, the hive box comes with a queen excluder so as to keep the queen secluded and secure from invaders or intruders. You will also love the telescopic cover that helps shelter the bees. This box also comes with 10 medium and 10 deep frames all of which have hexagonal surface foundation sheets. Other features include inner cover, metal cover, and bottom board. All these are made of good quality material and are longer lasting. Furthermore, the manufacturer provides the hardware for assembling the hive. Another top pick for beekeepers is this hive box from Popsport. It has all that you need for starting or expanding your beekeeping enterprise. The complete box kit beehive is tailored to suit 10 deep and 10 medium frames. The frames that come with the unit are made of white pine whereas the hive super is made of premium fir wood. The unit has an entrance reducer and a bottom which help secure the hive from predators and insects that invade the hive. Click here to read our full review of the Popsport Beehive Wooden House 20-Frame Complete Box Kit. 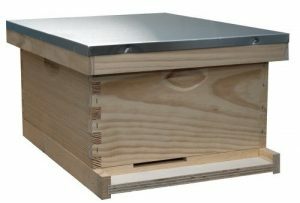 Some other notable features of this bee hive box kit include: pre-cut finger joints that interlink perfectly, a stylish, safe, and convenient overall design, and excellent ventilation. This beehive has a dimension of 11.4 2x 20.87 x 23.62 inches and weighs 45 pounds. You can easily remove or install its frames and it comes at an affordable price. This is an ingeniously designed beehive unit that offers the habitation for your bees. It boosts the productivity of your bees and minimizes disturbances when you are working on your hive – honey harvesting or routine checks. The 20 x 16 x 10 inches unit weighs barely 35 pounds. It is easy to remove and install the hive components and this makes a great choice for most beekeepers. It is even compatible with most hive kits and its frames can be shortened to suit any hive. Click here to read our full review of the BestEquip Wooden Honey Bee House. 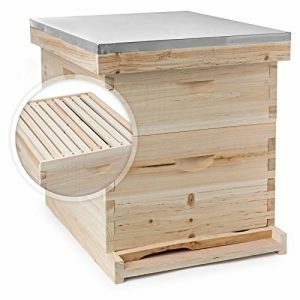 The BestEquip Beehive Wooden Honey Beehive is made of excellent quality corrosion-resistant pine wood and is compatible with automatic flow raw honey frames which are not included in the package. The auto flow honey frames can be installed to up to 7 pieces. It also features a clear end-frame view which allows the beekeeper to evaluate whether the honey is ready or not without opening the hive. It is easy to install and it comes with installation instructions. This beehive can last for up to 10 years. The Flow Hives have gained massive popularity in the recent past. As for the Flow Hive Classic Cedar 6 Frame, it is built using Western Red Cedar which is resistant to fungus and can repel insect invaders. It also has a screened bottom board, a queen excluder, inner cover, and roofing. The unit is easy to assemble and is delivered with an instruction manual which is easy to read and follow. 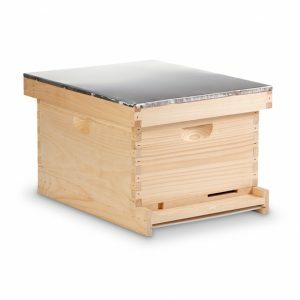 Some of the other features of the Flow Hive Classic Langstroth 6 Frame include: a brood box that has 8 standard frames without foundations and a super with 6 flow frames that has honey-collecting tubes and accompanying Flow Key. The Flow Hive is designed to minimize the disturbance of the bees when you are harvesting the honey. The Flow Key is inserted which then splits the honey cells and extracts the honey and directs it out of the hive. In this case you do not need a smoker or a beekeeping suit when you want to get some honey for breakfast. Your first step towards building a strong and self-sustaining bee colony begins with the selection of the best home for your bees. Goodland Bee Supply is a brand that is known the world over for its wide selection of beekeeping equipment. 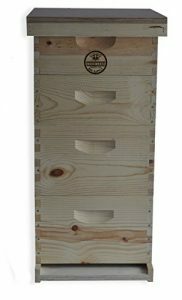 The bGoodland Bee Supply GL3STACK 3 Tier Bee Hive Kit has been built to meet the needs of every beekeeper. It is one of the most sought-after beehive kits thanks to its impressive interior and exterior features. Users seem to echo similar accolades about this unit and hence the reason for its addition to this list of the best bee hive boxes in the market. It ranks highly in terms of quality, price, capacity, durability, and compatibility of hive components. Click here to read our full review of the Goodland Bee Supply GL3STACK 3 Tier Bee Hive Kit. This kit from Goodland features 2 Goodland Bee Supply deep hive boxes in addition to 1 shallow hive box. It also comes with 20 and 10 large and small pine frames respectively. These have pre-waxed foundations which is a plus for the beekeeper. The pre-waxed foundations are 20 and 10 large and small Pierco plastic foundations respectively. These are black in color. Other great features of this kit include: 1 entrance reducer, a telescopic hive cover, a bottom base board, and an inner cover. All these help keep the hive box in excellent condition for the bees. The unit comes unassembled and that means you have to assemble it. It is however very easy to do this, given the simplistic design of the box and hive components. One of the best ways to ascertain whether a product is good for you or not is by firstly checking out buyer reviews (like this one). Simply type whatever product you are considering on your search engine then enter and you will get literally dozens of views and reviews. 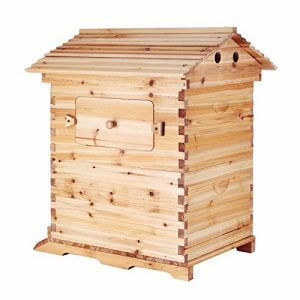 The SummerHawk Ranch 34991 Backyard Beehive is ideally a hive box that is highly sophisticated when compared to other hive boxes. It can be best described as a modern beehive for a modern beekeeper. This unit is well suited for all skill levels and will suffice as a backyard or commercial hive. 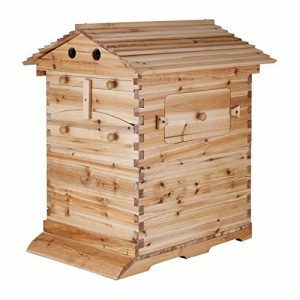 Click here to read our full review of the SummerHawk Ranch 34991 Backyard Beehive. Some of the defining features of this hive include: the quick-check viewing window positioned on the rear of deep super. This allows the beekeeper to monitor the bees without disturbing them. Available also is a screened bottom board that has attachments to be used when setting it up on the hive stand. The stand is sold separately by Summer Hawk Ranch. 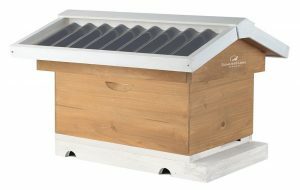 Other great features of the hive include: telescopic cover with runoff gutter, 8 wood frames that come with plastic foundation, and assembly instructions. This hive makes the best choice given its price and quality position. If you have been around for a while, then the name Honey Keeper can never sound alien. It is one of those beekeeping brands that have gained massive popularity among beekeepers. One of the things that make the brand stand out from the crowd is the top notch quality of its equipment. It is also known for a wide choice of equipment ranging from bee suits to honey extraction equipment. The 20 Frame Complete Box Kit from Honey Keeper lives up to what this brand is known for. It is ingeniously designed to bring out one of the best homes for your bees. The hive box is not only spacious enough to hold a thriving bee colony but it is also expandable making it an excellent choice for all skill levels. 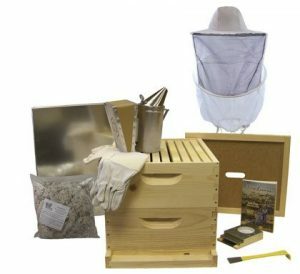 This is a beekeeping kit that will grow with your business. Click here to read our full review of the Honey Keeper Beehive 20 Frame Complete Box Kit. 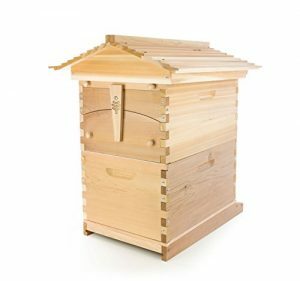 Some of the notable features of this Langstroth standard hive box include: an easy to assemble hive box with 10 deep and 10 medium frames. The frames also come with foundations. The entrance reducer is also available which helps regulate air movement and keep off mice. The unit also has a queen excluder, solid bottom board, and inner cover. All these help keep the hive box safe and favorable for the bee colony. In addition, a telescopic cover is available to help keep out weather elements and ensure the interior is cool and dry in all seasons. This is indeed a unit that will guarantee a thriving bee colony. It is also important to note that the kit is compatible with other hive components and hence can be expanded whenever there is need. The Warré hive is one of the best bee hive box units for bees. Ware Manufacturing have designed this unit to ensure you provide the best home for your bees and enjoy maximum productivity from your bees. The hive is made from white-stained cedar, one of the most durable and insect-resistant types of wood. The unit comes unassembled but is pretty easy to put together all its components. The peaked roof of the Ware Manufacturing Beehive helps keep rain water off your hive. The unit also has two observation windows and ventilation with adjustable airflow. This is required for keeping the hive temperature within the required levels during hot and cold seasons. This unit is also expandable. You can simply add new boxes below so as to accommodate new bees and their honeycomb. As for price it is affordable and a sure quality for money. 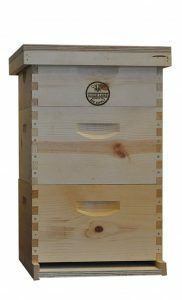 The US-made Mann Lake Assembled Complete Hive Kit is a popular choice among beekeepers. The unit comes pre-painted and it is made of pine wood. Since it is already assembled you have little to do upon delivery. The unit includes a hive box with an inner cover, a telescopic roof, entrance reducer and a bottom board. However, it does not have a queen excluder. Click here to read our full review of the Mann Lake HK160 Assembled Complete Hive Kit. 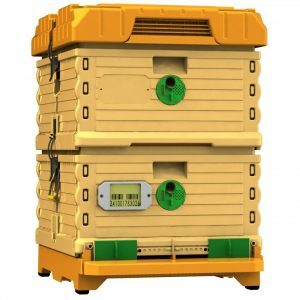 One of the signature features of the Mann Lake HK160 hive kit is the fact that it provides room for expansion once the bees have exhausted most of its foundations. The unit allows for the addition of a second deep hive body and that means you can scale up when need arises. The items that come with the unit are made of exceptional quality wood. However, you might have to paint it just to add some aesthetic value. You also have to check and ensure gaps between frames are well arranged. This is yet another great investment for any beekeeper. It is designed and manufactured by Goodland Bee Supply specifically for the beginner. Goodland Bee Supply is one of the top brands in the world of beekeeping and this unit proves that. It offers top notch quality when it comes to interior and exterior features and also comes at an affordable price. Delivered in the package are 2 large brood body boxes in addition to 2 super boxes. There are 20 each large and small frames made of pine wood, as well as as 30 each large and small black plastic Pierco foundations. Available also are a bottom board, inner cover, telescopic hive cover, and an entrance reducer. The unit comes unassembled just like all other Goodland Bee Supply products. This is done in order to minimize damage during shipment. 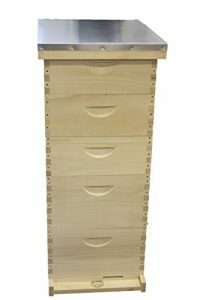 The hive box is easy to assembly and do not necessarily require nails for reinforcement. All joints are perfectly-fitting and this is an advantage. Overall, the product is of excellent quality and worth every penny. One of the things that really matter in a bee colony is the kind of habitation in question. Bees are highly sensitive to weather changes such as temperature and cold. A little moisture in the colony can result in bee diseases and infections. That is precisely the reason why the Little Giant 10 Frame Beehive makes one of the best homes for bees. It is designed with the needs of the bee in mind. Its interior and exterior features makes it one of the best since it not only shelters the bees from elements of nature but it also has sufficient space underneath to facilitates free air movement which is ideal for maintaining the required temperature and moisture levels. Click here to read our full review of the Little Giant 10 Frame Beehive. Little Giant have built this hive box using Eastern pine which is alluring to the bees. The unit is delivered in good condition and ready for painting. Inner components have also been built in such a way that they can interlock easily without the need for any tools. The hive box also comes with a telescopic cover that helps prevent direct sunlight and rain from getting into the bee colony. The metal cover is also preferred since it protects the wood from effects of weather elements. Vented inner cover also ensures free air circulation within the hive box. You will also get a mite grid that helps keep mites off the bee colony. 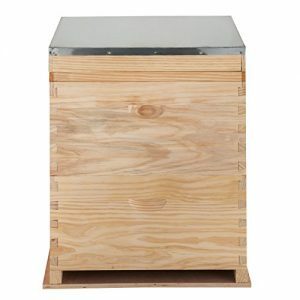 All these in addition to the entrance reducer make this hive box an excellent choice for every beekeeper. This is perhaps one of the most popular beehive kits for beginners and professionals alike. It is a complete kit with a Langstroth hive. When you buy the unit you get the hive in addition to 10 frames, excellent quality gloves, an entrance feeder, a beekeeping suit, a smoker with fuel, a hive tool, and instruction manual. This manufacturer also offers a money-back guarantee in case you are dissatisfied with the package for whatever reason. Click here to read our full review of the BuildaBeehive 10-Frame Deluxe Beehive Starter Kit. The 10 frame supers that come with the hive are wooden and the 20 frames have plastic foundations which can be left out or replaced if you like. Available also in the hive are: an inner cover, a reversible entrance reducer, a metal roofing and a bottom board. Given all that is delivered with this hive, this is probably one of the most affordable bee hive box kit you can get in the market. One of the major concerns to beekeepers is the condition within the hive especially during those extremely unbearable weather conditions. The Apimaye 10 Frame Langstroth Insulated beehive Set is designed to eliminate all worries that cripple even the most experienced beekeeper. It is built to guarantee a excellent habitation of the bees. All inner and exterior components of the hive make it possible for the bees to thrive even during the cold winter months. This hive kit is made of UV-resistant plastic (HDPE) and has a double layer insulation. This helps keep the colony warm when it is extremely cold and also ensure the interior is cool in summer. The unit is also resistant to moisture which usually creates an ideal a breeding ground for fungus in wooden hives. The Apimaye beehive is one of those units that has excellent ventilation and allows the use of wooden of plastic frames interchangeably. Its design is also quite unique when compared to other hive kits. This kit has a screened bottom board that has a pollen trap and drawer. This allows the beekeeper to collect pollen that fall and get trapped on the bottom drawer. This unit is also secure from varroa mites thanks to its screened bottom board. It also has an entrance reducer that helps prevent looting. The bees are also well protected from drowning given the top cover feeder that allows you to easily feed the bees without opening the hive. Click here to read our full review of the Apimaye 10 Frame Langstroth Insulated Beehive Set. Delivered assembled and does not require painting. A great beehive kit for beginners and professionals alike. It is a simple design that makes it easy to open and inspect, feed or move your bees. One of the best hive boxes when it comes to fighting varroa mites and small hive beetles. Boasts top notch insulation. It can withstand hot as well as extreme cold weather conditions. Its interior design prevents moisture buildup which normally encourages fungus growth. It also helps prevent the bees from consuming too much honey when cold during winter. Comes with 20 plastic frames that are perfectly fitting for easy setup of the swarm comb and foundation. Includes screened bottom board, frame spacers, entrance reducer, top feeder, and division/uniting board. Not prone to warping and rotting as wooden beehives. Helps ease the bees the burden of sealing the hive with propolis. Has a design that allows the hive components to be stacked together for easy transportation. Weighs 58.2 pounds and has dimensions of 27.5 x 24.5 x 20 inches. Quite pricey, though nonetheless worth it. The bee hive boxes you choose will hugely affect your potential for growth as a beekeeper. The best bee hive boxes discussed above offer each offer great features, benefits, and price. Choose one that meets your needs and is within your budget. Do you own any of the bee hive boxes on this list? Which ones do you think should be added to this list? Leave a comment below and let us know. Hi Terry, yes they are easy to clean.